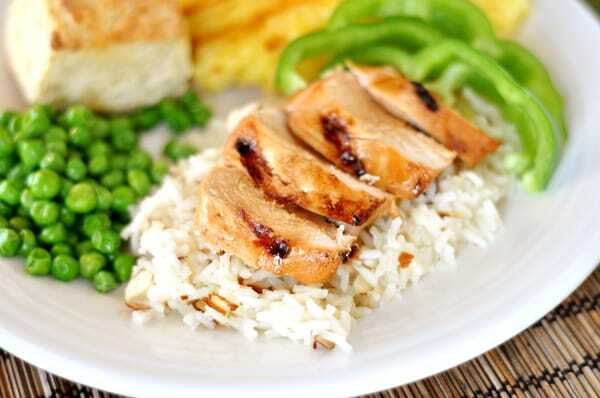 Incredibly simple, this juicy, teriyaki chicken is the result of a day-long marinade in a combination of every day ingredients that come together to make a fantastic teriyaki flavor. This wonder-of-a-meal has been gracing our table for many years now. Our favorite way to serve it? Alongside this baked brown rice (with toasted almonds and green onions stirred in after baking) and with fresh, grilled pineapple, biscuits and sliced green peppers (you could grill these babies, too). Easy to prepare. Easy to not mess up. And definitely easy on the ol’ taste buds, this meal is refreshing and extremely delicious. Speaking of grilled delicacies, by the way, I’ve updated my Favorites tab over there on the right with some of my favorite grilling/BBQ/outdoor food for the summer season. Enjoy! If you don’t have fresh pineapple or choose not to use it, you can use a large can of pineapple chunks, draining and reserving the liquid for the marinade, and serving the pineapple chunks alongside the grilled chicken. 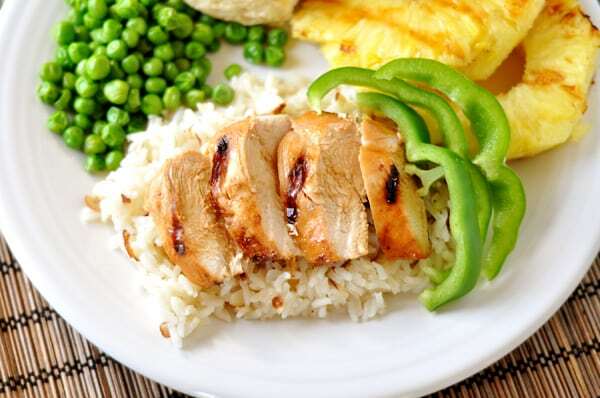 I like to serve this teriyaki chicken with baked brown rice (cooked with chicken broth – and after baking, I stir in toasted almonds and sliced green onions). Glad you brought this out of the archives…it was delicious! I make this regularly and we love it. It’s one of my favorite meals to prep for my lunches for the week. Do you think it would be possible to cook this in a slow cooker? I would like to use this to make wraps for lunch through out the week! I am wondering if you think this will work well with pork chops, too. I love your food, and always come here first! I haven’t tried it but I bet it would work just fine! Just keep an eye on grilling time since it might be different with the pork chops. My husband declared this chicken “awesome” and I loved it too. 🙂 This is definitely going into my regular dinner rotation. I put the marinade and chicken breasts in a freezer bag and kept the whole thing frozen until I was ready to use it. I moved the bag to the fridge to defrost the chicken. I am going to make up a couple more batches to keep in the freezer for busy weeknights. Great meal. When you post chicken breasts, would you mind including a weight? Or just let me know how many ounces your standard chicken breast is. They must grow larger than normal chickens in the Northwest because I think 6 of the ones I have would serve at least 12. I’ve also had proportion problems in meals like your Slow Cooker Southwest Chicken Stacks. I think a simple weight guideline would solve the problem. Thanks! Delightful and perfect for a busy weeknight. We ate ours on the patio while enjoying the last few days of summer before school starts. Will make again often. Thanks! A friend told me about your site a few months ago and I LOVE IT! Thank you for trying out all of the recipes first – I hate recipe failures and I haven’t had one from the dozens of recipes I’ve made from your site. How much of the green onions and almonds did you add to the rice? Keri – I kind of eyeballed it, but probably about 1/2 cup almonds and 3-4 green onions, sliced. Made this last week when we had a couple from church over. Everyone thought it was super yummy! Thanks! Made this last night for dinner and it was a BIG HIT!! YUM!! I only got about 4-5hrs marinating time, but it was still yummy. I cut the chicken up into smaller pieces (each breast into about 3 pieces) for maximum marinade exposure & faster grilling time. I also basted the pieces w/ the marinade while grilling. Before I poured the marinade over the chicken, I set out about 1/2 c to pour over the top after grilling. That made it extra delish. My hubby wished I would have had more cuz he wanted to pour it over his rice. Next time, I’ll set out more like 1.5 cups and reduce it down like previous commenter said. Def. a keeper here! (I served it w/ the brown rice and almonds/green onions as you suggested and all loved it). THANKS! This was DELICIOUS!!! Super fast to prepare and incredible flavor (even with only 4-5 hours marinating time). Definitely a keeper-recipe!! Thanks! My family loved this recipe!!! I am making it for the second time tonight because my husband couldn’t get enough the first time 🙂 I put the marinade in a pan on the stove and reduced it down and used it over the top of rice and chicken and it was awesome. Thanks!! We made this for a family bbq on Sunday. The chicken was very tender. I used regular soy sauce and it was not overly salty, I did marinate for 5 hours though. Everyone kept asking for extra sauce so maybe I will reserve a little and cook it up. The small cans of pineapple juice that come in a four or six pack are exactly 3/4 cups. These are a staple in our pantry. Thanks! This was a keeper. We just made this last night and it was delicious! I cubed the chicken and marinated it for 8 hours. I then put it on kabobs with fresh pineapple, green peppers, and red onions and on to the hot grill. Wow! Thanks for a keeper! This looks delicious!! P.S. By “grill” do you mean outside on a gas grill? What if you have no outdoor grilling equipment. Any other way you can cook it?? Marie – yes, by grill I mean I use an outdoor grill. You could try broiling it or cooking it up in a skillet. I’ve never tried it so you’d have to experiment but I’m sure it would work ok as long as you watch the cooking time. Yum Teryaki is always a fave especially on the grill. I love throwing red pepper on with the pineapple too. 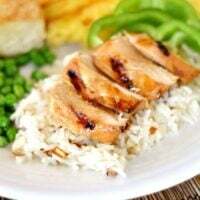 I’ve been looking for a simple teriyaki recipe, this one might just be it, looks great! Awesome! I bought an entire container of pineapple juice for a recipe that called for 1/3 cup. Now I know what to do with the leftover. I always know your recipes will turn out. I bookmark every other recipe you post. Thanks! Just stumbled across your sight and already found several recipes I want to try. I see you are a fellow Cook’s Illustrated lover. I am also from the midwest. We must have similar tastes because a lot of your food looks delicious. Lots of things I would make for my own family. Looking forward to checking your sight often. Thanks for the lovely posts and recipes. I was going to make chicken tonight for dinner and was searching for a new recipe to try. I think I just found what I was looking for! This sounds so good, my husband would really love it! Going to check out your grilling favorites since I have been grilling up a storm recently! Thanks for the recipe. I’m super excited to try it. It looks amazing. Ruth – oh, heavens, don’t drag your kids to the store over the soy sauce! Try it with regular. It shouldn’t make a huge difference, just don’t let it marinate longer than the specified time. omg this looks delicious! The best part is that it seems super easy to make, which I love. I am going to have to try this. I was thinking that if you used canned pineapple for the juice, you could mix in the pineapple with some green onions and maybe diced red peppers into rice to serve on the side. This looks so delicious, Melanie! Don’t you just love grilled pineapple with teriyaki? Oh- and your baked brown rice is a family favorite! That is really saying something, because before I tried your recipe my family wouldn’t eat brown rice! It is amazing!